Increasing demand has fueled growth and new changes for San Diego’s highly-rated and only 100 percent certified organic specialty coffee roaster. Cafe Virtuoso will debut its freshly-remodeled cafe, when it opens its doors again on Wednesday, November 23, with a new look, greatly-anticipated additions to the menu, as well as expanded and upgraded offerings like pour over coffee. The Cafe Virtuoso remodel includes new concrete flooring, bold interior colors, a hand-painted menu by local artist and Cafe Virtuoso barista Mary Jhun, and a coffee counter three times the previous size equipped with taps for the cafe’s signature cold brew, cold brew on nitro, and kombucha, along with a unique built-in pour over “filter bar.” The filter bar allows baristas to serve customers full Chemex and Kalita pots of in-house freshly-roasted organic specialty coffee to enjoy in the cafe. 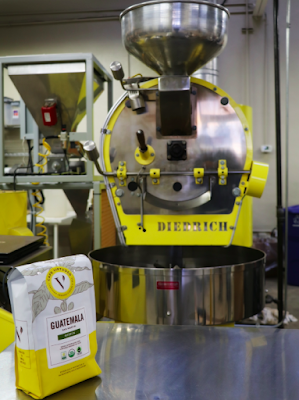 The recently-renovated cafe, centered around the company’s iconic bright yellow Diedrich coffee roaster, is located in Barrio Logan in the former space of it’s roasting and wholesale facility, which was moved last year into a larger space two doors down. The new roastery houses Cafe Virtuoso’s latest and much larger custom high-tech 35 Kg Loring roaster that was needed in order to keep up with rapidly-increasing customer demand. While the remodel is essentially complete, Cafe Virtuoso is also eagerly awaiting the arrival of all new furniture that is being custom made, including large community tables and more comfy and cozy seating throughout. For customers seated in the cafe, in-house bottled water will be provided for each table and there is now an option for iced drinks to be served in glassware, opposed to previously being available only in to-go cups. An assortment of pastries baked and delivered fresh daily from Bread & Cie, along with Kombucha served on tap from San Luis Obispo-based Whalebird Kombucha are also new to the menu. 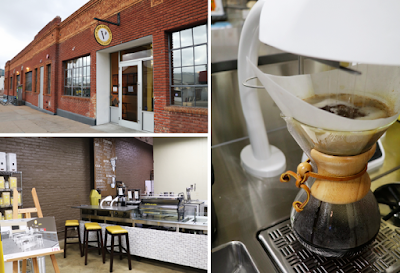 "Our reason for making these upgrades is to further enhance the experience of our customers who love our coffee and tea and also enjoy spending time in our cafe," says Laurie Britton, founder and CEO. "We’re very excited and happy with the result so far, but we still have a few more surprises in regard to new furniture upgrades in the next few months that we think our customers will be very happy about too." Additionally with the remodel, Cafe Virtuoso has designated a space in the southeast corner of the cafe that will be sub-leased to a non-profit organization. The non-profit, currently in the final stages of being formed, will create a certified Specialty Coffee Association of America coffee training facility with the purpose of helping disadvantaged populations acquire general working skills and SCAA job training certifications to begin new careers in the specialty coffee industry. Savannah Britton, Cafe Virtuoso’s head of quality control, and an SCAA/Barista Guild of America Level 2 Certified Barista, will serve as the organization’s board chair and the lead instructor. Cafe Virtuoso’s cafe is open Monday-Friday from 6:30am to 3pm, Saturday from 7am to 2pm and Sunday from 8am to 2pm. For more information, visit cafevirtuoso.com.